When I first saw the recipe for these over on the Tasty Kitchen blog, it was like two halves of my heart had been finally made whole. 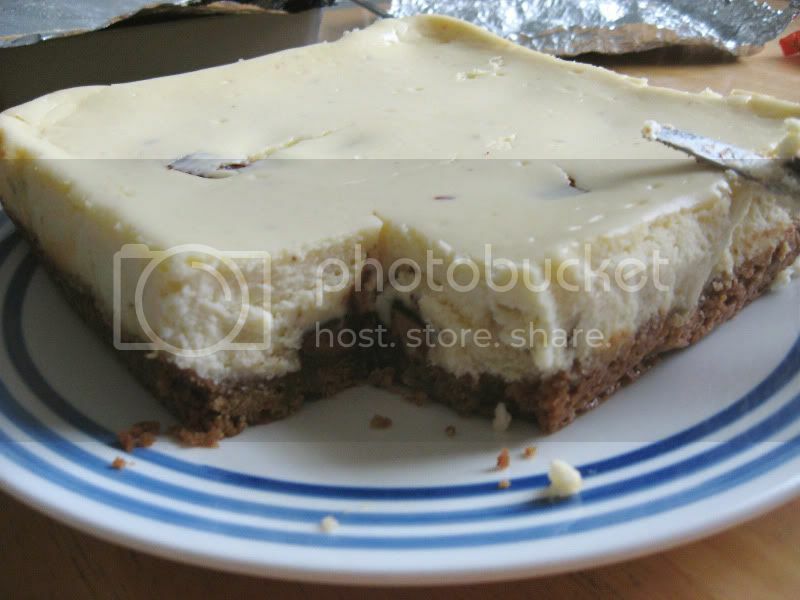 Cheesecake! Reese's Peanut Butter Cups! 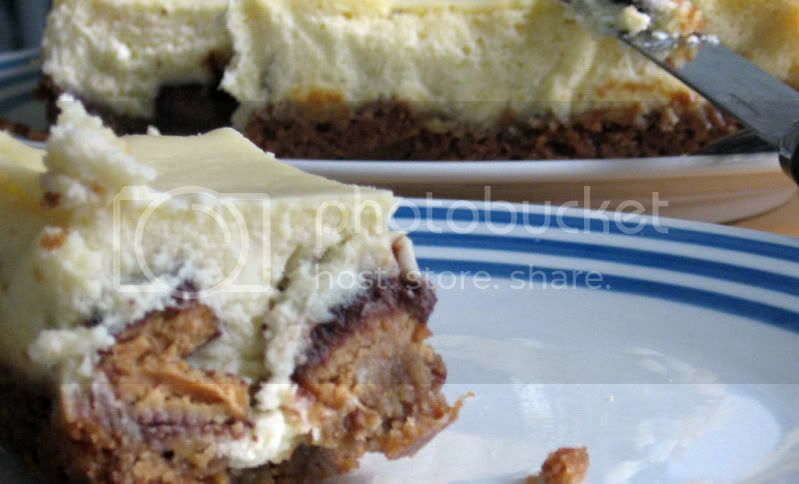 In an easy to make bar form! What in the world, how had I never thought of this before?! 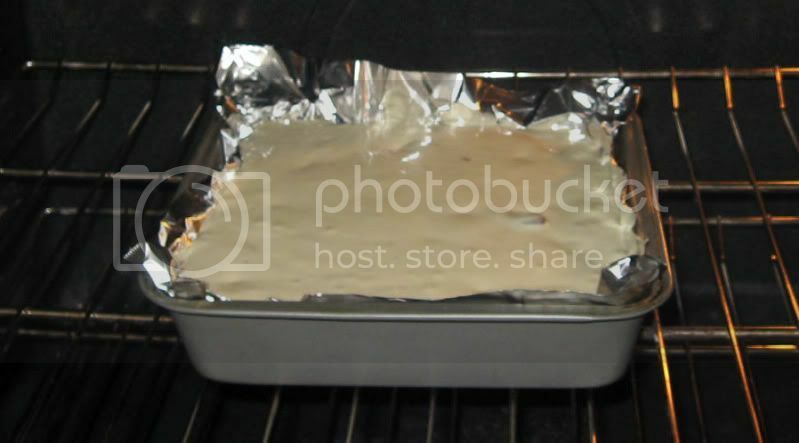 Prepare an 8-inch square baking pan by lining the pan with aluminum foil, leaving 3-4 inches of foil draping over the sides of the pan. Bake until the crust is beginning to brown, about 12 to 15 minutes. Let the crust cool on a cooling rack for about 30 minutes. 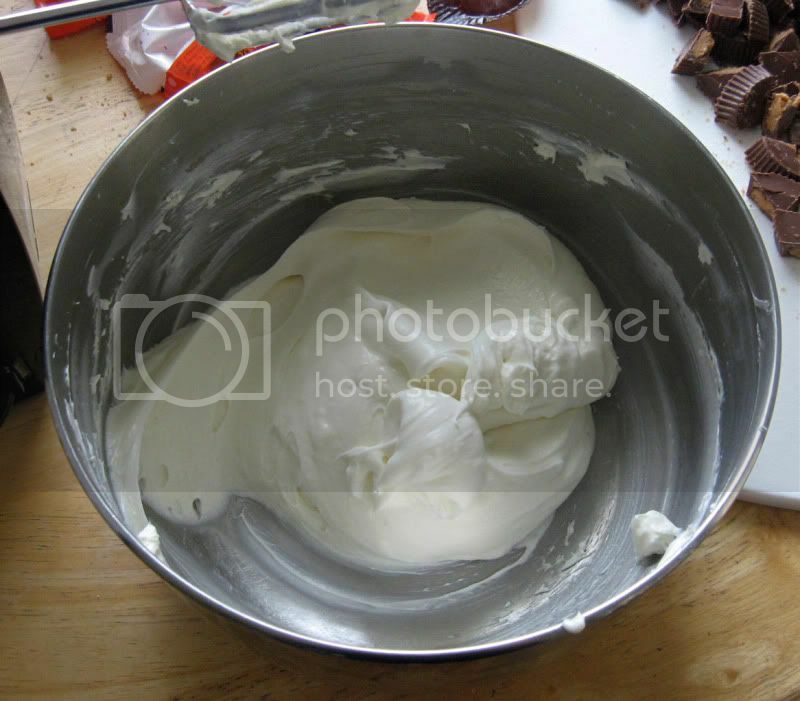 In a large bowl, beat the cream cheese until it is very smooth, about 3 minutes. Scrape the beaters and sides of bowl frequently. 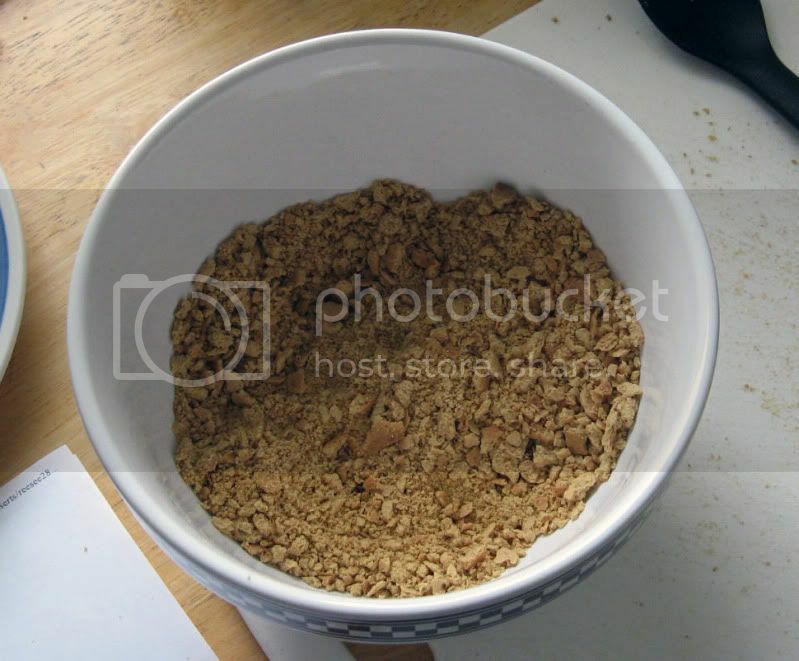 Gradually beat in granulated sugar until the mixture is combined, about 1 minute. Beat in eggs, one a time, making sure that each is fully incorporated. 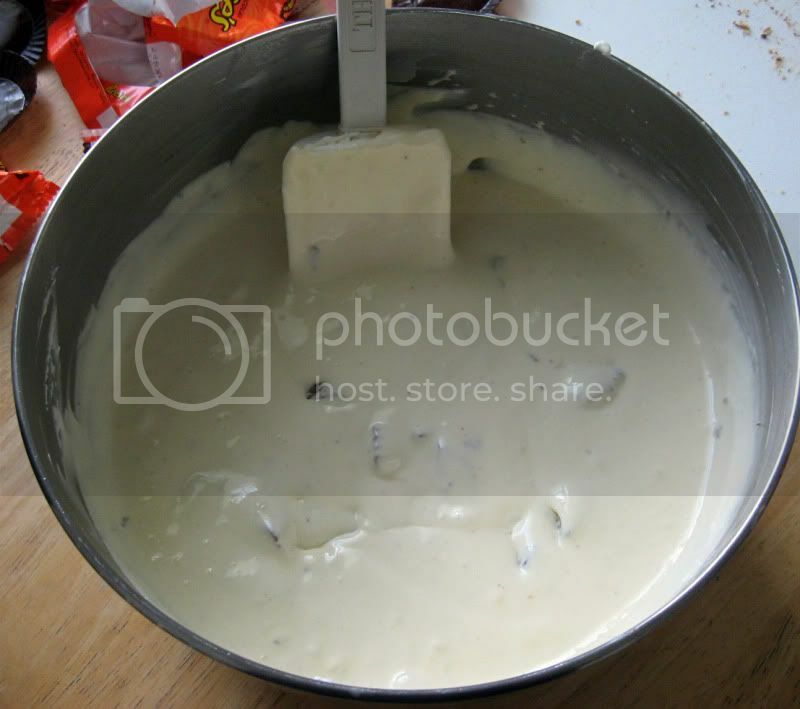 Beat in sour cream and vanilla extract until fully combined, about 30 seconds. 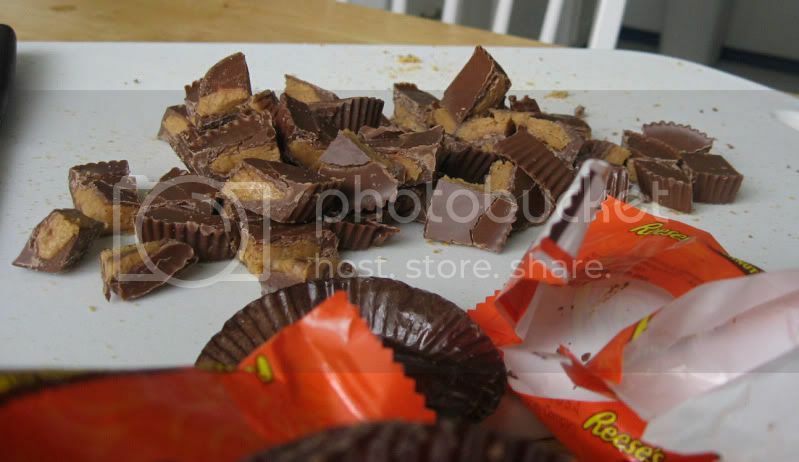 Unwrap and cut 9 Reese’s peanut butter cups (0.75 ounce each) into 6 pieces. 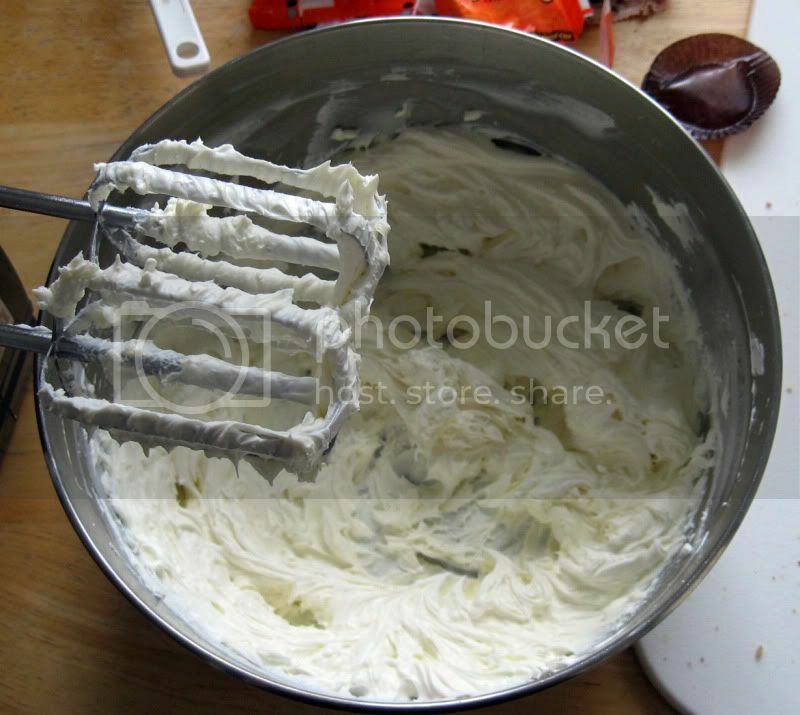 Gently fold into the cream cheese mixture. 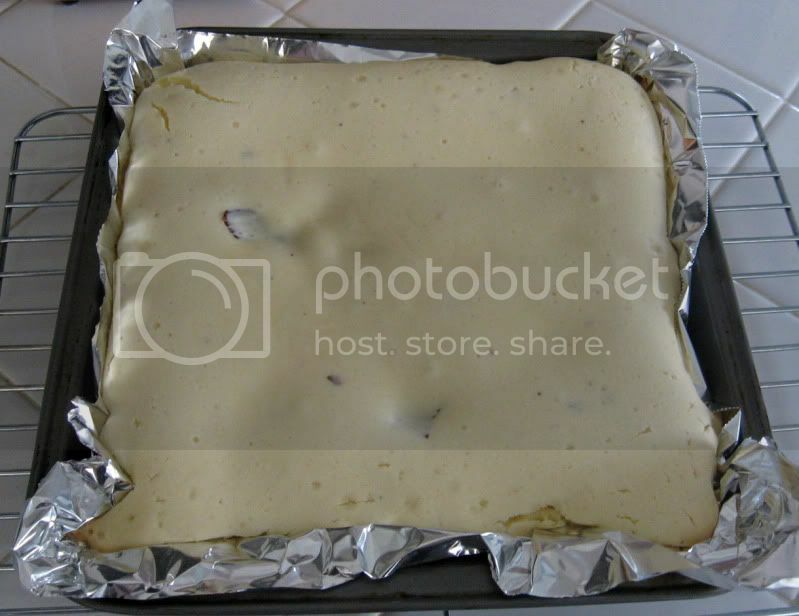 Scrape the cream cheese mixture into the baking pan, over the top of the cooled crust. Spread evenly. Bake until the edges are set but the middle still jiggles slightly when the pan is shaken slightly, about 35 to 40 minutes, rotating the pan halfway through baking. If you don't have a food processor, like me, here's how you can achieve these crunched up graham crackers. Stick them in a plastic bag and use a rolling pin! If you don't have a rolling pin, also like me? Improvise with something else. I used the thing of salt. Not a salt shaker, but one of the large things a bunch of salt comes in. Works just as well. Important when baking? Reading directions. Because I skimmed and thought I read 3/4 CUP butter, when it actually said 3/4 STICK butter. Major oops. 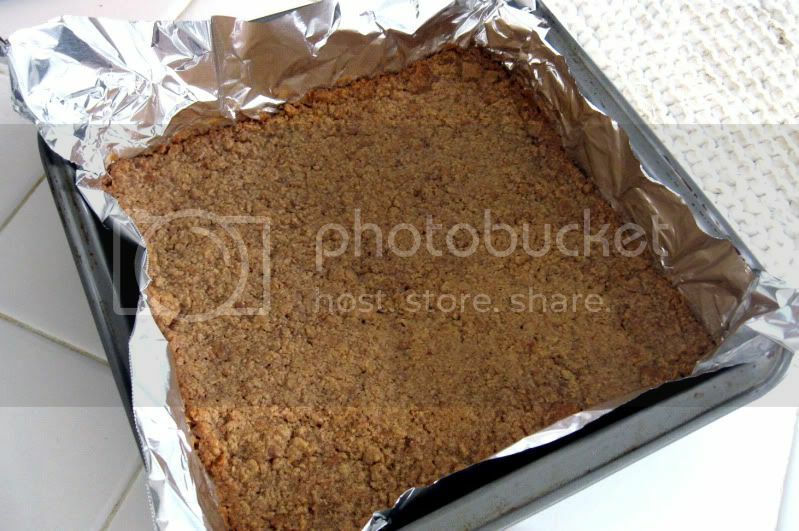 I added some more graham crackers and had to bake it for longer than listed. Seems to have turned out okay enough, thankfully. After the bottom has baked. Yours may look a little different if you actually put in the correct amount of butter!! While the crust is sitting for 30 minutes, I cut up the Reese's. And when there was about 15 minutes left, I started on the filling. This is just the cream cheese after it's been beaten for a while. Once the sugar is added. It's a little fluffy at this point. I had photos from all the different steps with the filling, but it really just looked the same. White, liquidy. So here it is with the Reese's bits added in. 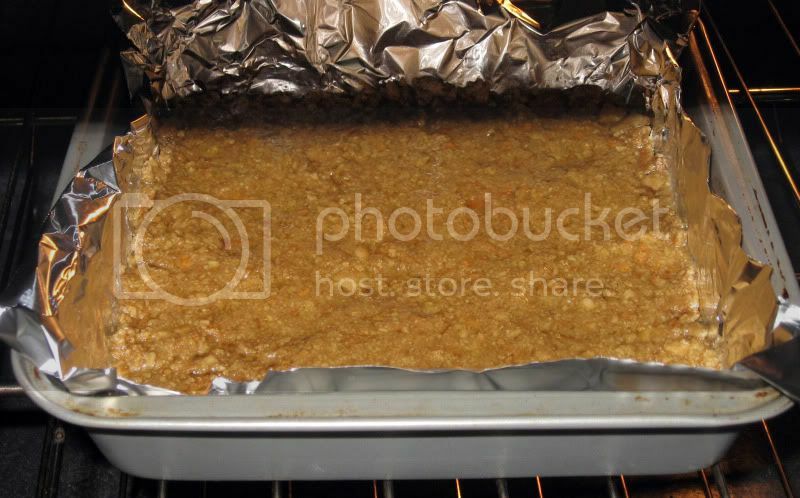 Yep, I forgot to take a picture after I added the filling into the pan, so here it is in the oven. It fills very close to the top! Here it is fresh out of the oven. Now here's where all of the waiting begins. First you have to let this sit out for two hours. THEN you have to put it in the fridge for at least three hours before you can eat it! So much waiting! But! Finally! It's ready! Lift it out of the pan by the foil and unwrap it, stick it on a plate. Slice into it and enjoy. Sorry it's not the sharpest. I was impatient and don't have a fancy camera. I cut into this when it was just three hours into the fridge, and it was barely cold, so I'd definitely recommend waiting a little bit longer. I thought I'd be over the moon for this since I love cheesecake and I love Reese's, but I don't know, it didn't wow me as much as I thought it would. I guess maybe I have been spoiled by the light fluffiness of The Cheesecake Factory cheesecakes that this was a little too heavy for my tastes. It's also my first try at any sort of cheesecake ever, so I guess I should just be happy it turned out as well as it did!